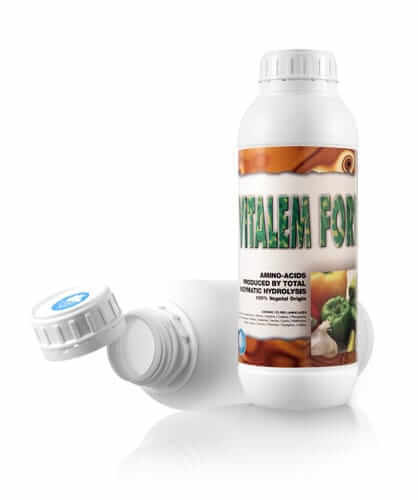 Vitalem Forte - Kenya Biologics Ltd.
VITALEM FORTE is a liquid formulation with high concentrations of free L-amino acids derived from an enzymatic hydrolysis of vegetal proteins, a process which is carefully controlled to keep the substances biological activity. Amino acids of VITALEM FORTE play an essential role in the maintenance of the hydric equilibrium of plants, especially during adverse climatic conditions. Proline influences pollen fecundity, while others like methionine, arginine and lysine promote polyamides synthesis that regulate basic physiologic processes like germination, flower senescence or fruit ripening. Application of VITALEM FORTE in irrigation systems provides essential metabolites, which are easily absorbed by the root systems, and increases soil fertility by stimulating microbial activity. VITALEM FORTE can be used as a powerful tool to reactivate plant growth and metabolism altered by adverse physiologic events or abiotic stress. Use at any stage of vegetative crops, especially after stress situations such as drought, frost, pest and pathogens attacks or herbicide applications. VITALEM FORTE can be applied in foliar spraying or diluted in irrigation water in soil applications. Apply at 10–15 days intervals using sufficient water to ensure thorough coverage. VITALEM FORTE is stable for at least three years since manufacturing date. Store in the closed original container in a cool and ventilated area. DO NOT store for prolonged periods in direct sunlight. Keep away from food, drink and animal feed. Keep out of the reach of children. VITALEM FORTE is highly compatible with most pesticides and fertilizers. For application with plant protection products follow pesticide label directions and make jar test for compatibility. *Standard aminogram: aspartic acid, glutamic acid, serine, histidine, glycine, ghreonine, arginine, alanine, tyrosine, valine, methionine, phenylalanine, isoleucine, leucine, lysine, hydroxyproline and proline. Horticultural crops and vegetables 10 – 15 1 – 2 Apply at transplantation and repeat at 3-4 weeks intervals throughout the crop cycle. Pome and stone fruits 10 – 15 2 – 3 Apply at buds bursting, fruit setting and fattening. Citrics 5 -10 2 – 3 Apply at buds bursting, fruit setting and fattening. Grapevine – 1 – 2 Apply at buds bursting, preflowering, fruit setting and 3 weeks before harvest. Olive tree 5 – 10 2 – 3 Apply at preflowering and fruit hardening. Banana tree 10 – 15 – Apply 3-5 times throughout the crop cycle. Strawberry 5 – 10 – Apply 3 times throughout the crop cycle. Cotton – 2 – 3 Apply at first stages and beginning of flowering. Ornamentals 5 – 1 0 1 – 2 Apply at transplantation and 3-4 additional times at two weeks intervals. Beetroot 5 – 10 – Apply 3 times during the entire cycle. Potato 5 – 1 0 – Apply 3 times during the entire cycle.